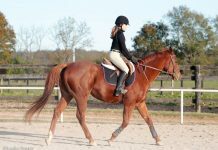 Q: I ride a 10-year-old gelding in my riding lessons. He always seems to pull towards the right. I don’t know if I’m doing something wrong, or if it’s him, but my instructor hasn’t noticed, so maybe it’s all in my head! Is there a reason that a horse would always pull in one direction, and what can I do about it? A: You bring up several issues but let’s start with why a horse might pull on the bit in just one direction. It’s not unusual for a horse to be naturally more balanced on one side. It’s similar to us being right or left-handed. To help support the weaker side a horse will try to lean on the rider’s hand. This puts extra weight on one rein, and that can be felt by the rider’s hand. This tendency is easily addressed in early training. But since the lesson horse you’re riding isn’t a young greenie, the one-sided pulling could be due to some other cause. One is low-grade soreness or stiffness. He could be more comfortable traveling the way he does. The other cause could be simple laziness. This often happens with lesson horses. They get bored or a little sour and pick up bad habits. As long as they still do their job no one corrects them, so the problem continues. Because this gelding’s behavior is so common, I doubt you’re imagining it. I encourage you to bring the problem to the attention of your instructor. He or she should be impressed. It demonstrates that you have a good “feel” for when your horse is unbalanced and also that you’re concerned for the horse’s welfare. If the gelding is sore he needs to be evaluated by a veterinarian. At the very least, his shoeing, teeth, bridle adjustment and saddle fit need to be examined to make sure they’re not contributing to the problem. 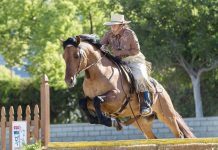 If it turns out that this one-sided pulling is just a bad habit, then the gelding needs occasional tune-up rides from the instructor or an assistant. Otherwise the gelding’s antics can limit your ability to learn and progress. Plus, a horse that pulls to one side on the flat is liable to run out or evade jumps in that direction, too. 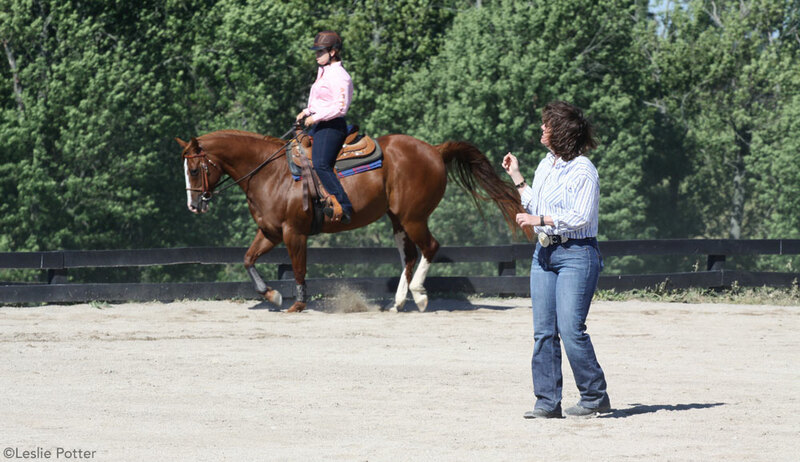 To correct a horse that pulls to one side, the rider has to physically encourage the horse to stop leaning on the bit and seek its own sense of balance. One tactic is to work on a large circle. We’ll say the horse pulls to the right, so circle to the right. As soon as you begin to feel your horse exert more pressure on the right rein, raise your right hand up and back until his nose turns inward. (You should be able to see his right nostril). At the same time you must also press into his rib cage with your right leg. The moment you feel his right (inside) shoulder lift, and his weight rock back onto his hindquarters, soften the contact with your right rein as a reward and continue on your circle. When he starts to lean on the right rein again, repeat the exercise. You have to be consistent in order for the horse to understand your request and comply. Because this exercise requires the proper use of multiple aids, it’d be ideal if your instructor could ride the gelding and demonstrate them. Visually observing the application of advanced horsemanship skills should be part of every lesson program. Thank you for all your great information. My horse does this; maybe these hints will help. Thanks!